If you know independent hotels, you’re already in on the secret: some of the best chefs and bartenders can be found grilling, glazing and mixing at unique hotels everywhere, from the established restaurant scene in Manhattan to delicious upstart foodie locales like Austin. We’re bringing you our chef’s & bartenders best picks—starting with a perfect pairing for September. Corn is still in the markets, you can have an outdoor party, and a good margarita still seems like a great idea. 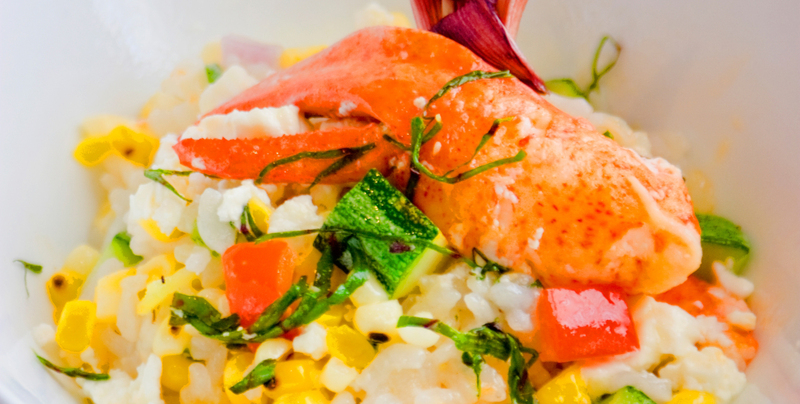 Read on for Chef Shawn’s Vermont Lobster & Corn Risotto recipe from cooking resort The Essex Resort & Spa, and Pacific Beach local hero/bartender Armondo Garcia’s very very yummy (yes, that is a technical cocktail descriptor) Chili Mango Margarita, from Tower 23. Squeeze the very last drop of summer out of sunny September! “I picked up some really nice local corn at the market yesterday and the first corn of the season reminded me of one of my favorite dishes. Risotto is one of my all time favorite things to eat and this recipe is on the top of my list. Place cob ears in clam stock and bring to a simmer. In another heavy bottom pan, start the butter, then add the onion, over medium high heat. When the onion becomes translucent, add the rice. This is one of the most important parts of risotto and that is to coat the rice with butter and then cook for another couple of minutes. Use a wooden spoon and make sure you keep moving the rice. Now add the wine, all at once. continue to stir. Let wine reduce by 75%. Start to add the stock in about five batches. You add stock, stir, then wait for the stock to be absorbed by the rice, stir, again add more stock and repeat to stock is gone. Taste the rice. It should be al dente. This means it should have a little bit of structure in the very middle, you can add water if it is not done yet. Now you can add the vegetables and lobster. Cook until the vegetable and lobster are warm, add parmesan, thyme, basil save some for garnish on top. 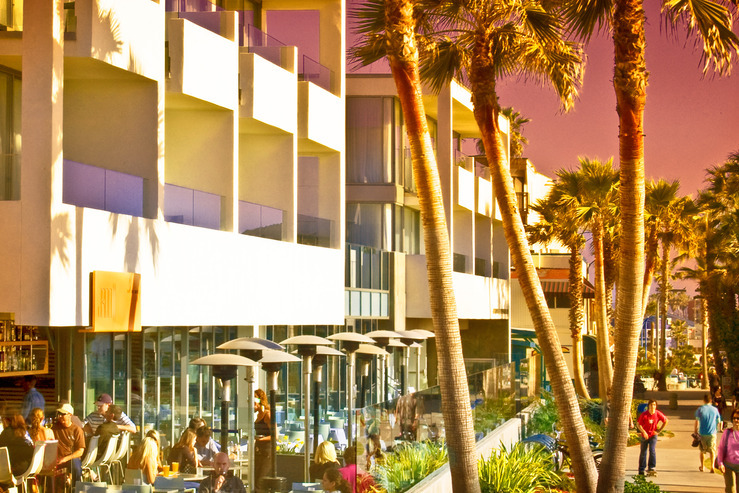 The drinking spot: Pacific Beach Boardwalk, ocean view. To your health! Bartender Armondo Garcia’s been at the helm of JRDN’s boardwalk-front bar for 9 years. He knows people, and he knows margaritas. This recipe is adapted for mixing at home—stop by Tower 23 and try it while watching surfers heading to chase waves at sunset. Rimmed with Tajin—a chili salt from Mexico—and garnished with a lime wedge. Add the tequila, sour mix, mango juice and to a cocktail shaker filled with ice. 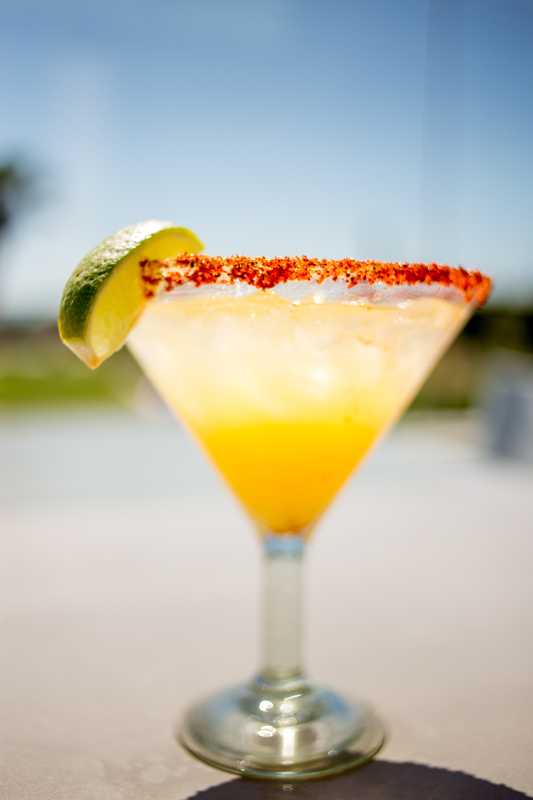 Run the lime wedge around the rim of a glass then gently press the glass into the bowl of Tajin seasoning. Coat the rim with Tajin. Et voilà. To your health!